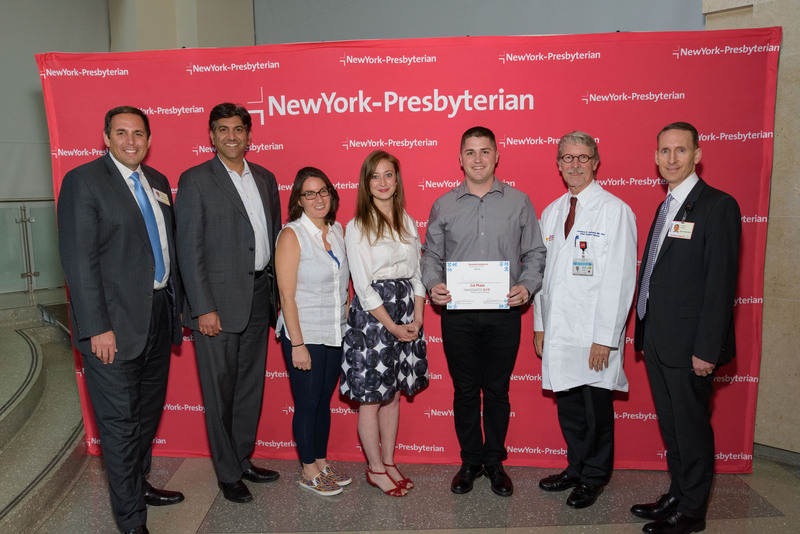 NEW YORK, NY--(Marketwired - June 10, 2016) - NewYork-Presbyterian announced the winners of the InnovateNYP Pediatric App Challenge during Demo Day on June 9, an event marking the completion of a 10-week long competition in which designers, developers, clinicians and startups worked to create tech advancements in pediatric healthcare. Sixteen teams spent 10 weeks designing and developing a working application that uses technology to improve pediatric healthcare. The finalists presented their concepts to a judging panel of healthcare and technology experts to determine the top apps based on innovation, feasibility, simplicity and their ability to help advance pediatric healthcare. The judging panel consisted of NewYork-Presbyterian leaders and national and regional tech influencers, including: Daniel Barchi, chief information officer at NewYork-Presbyterian, Dr. Lawrence Stanberry, pediatrician-in-chief at NewYork-Presbyterian/Morgan Stanley Children's Hospital, Naveen Selvadurai, co-founder of Foursquare, Aneesh Chopra, president of NavHealth and former chief technology officer for the Obama Administration, Rachel Haot, managing director at 1776, Jessica Leber, staff editor and writer at Fast Company and Minerva Tantoco, chief technology officer for the City of New York. "Demo Day was a great success," said Daniel Barchi, chief information officer at NewYork-Presbyterian. "The number of innovations around mobile technology that resulted from the Pediatric App Challenge is very impressive. The presenting teams' combined creativity, collaboration and forward-thinking solutions prove to be very promising as we use digital technology to garner solutions in the healthcare landscape." Contestants competed for $40,000 total in prize money, with first place receiving $25,000, second place $10,000 and third place $5,000. The fhirStarters application helps parents manage their families' medication administration without having to manually enter in prescription information. The app helps promote medication adherence for pediatric patients, an essential determinant of clinical success. Created by Riley McKenna and Anees Merzi. Teen Screen doubles as a mental health screening application for teenagers between the ages of 12 and 18 and a tracking device for patients as well as healthcare providers. Teen Screen assesses a user's suicide risk and provides tools to seek help. The app includes a clinically-tested patient questionnaire which tracks screening results and connects the teen with a doctor. The app also has a clinician facing component that allows different medical professionals to collaborate on patient care, providing a truly personalized experience. Created by Vikas Mandadi. A complete patient engagement app, NYP Care Companion helps young patients recover faster by guiding them and their family members throughout treatment, providing comprehensive information about the child's condition and monitoring their progress. The application consists of two interconnected applications, designed to be used by both the child and parent(s). Created by Ekaterina Chernetsova, Roman Makhnenko, Andrew Gluschenko, Dan Piekarz, Alexander Demura, Margarita Olshanskaya, Egor Kobelev, and Allan Wellenstein. "We continuously strive for exceptional patient experience and quality of care for our patients and their families," said Dr. Peter Fleischut, chief innovation officer at NewYork-Presbyterian. "By challenging such inventive minds, we are primed for success in developing tools that can drastically improve how patients and providers use technology." NewYork-Presbyterian aims to collaborate with the final teams to refine their applications for potential implementation as part of the hospital's continued effort to find new solutions to better the overall patient experience. To learn more about the InnovateNYP Pediatric App Challenge visit www.innovatenyp.org/pediatricappchallenge.